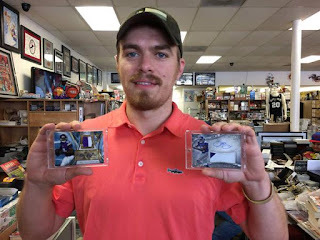 Sports Cards Plus Store Blog: INVENTORY REDUCTION SALE - FLAWLESS, IMMACULATE, SPECTRA, NATIONAL TREASURES, EXQUISITE, FIVE STAR, BLACK GOLD, SELECT, CONTENDERS, BOWMAN, TOPPS TIER ONE, AND ALL YOUR FAVORITE PRODUCTS AT OUR LOWEST PRICE EVER! INVENTORY REDUCTION SALE - FLAWLESS, IMMACULATE, SPECTRA, NATIONAL TREASURES, EXQUISITE, FIVE STAR, BLACK GOLD, SELECT, CONTENDERS, BOWMAN, TOPPS TIER ONE, AND ALL YOUR FAVORITE PRODUCTS AT OUR LOWEST PRICE EVER! The Sports Cards Plus INVENTORY REDUCTION SALE continues and collectors are coming from all over Texas to pull their favorite Super Hits. The definition of a Super Hit is the card you always wanted. Jonathan and his son came in looking for some low numbered Kobe Bryant Autographed cards, but Jonathan already had every Kobe Auto we had in stock. 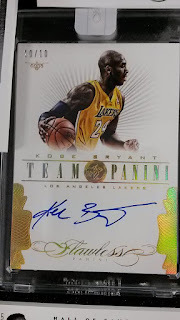 Jonathan didn't have a Kobe Flawless Auto so he decided to pick a box of Flawless from The BEST CASES in The Hobby. 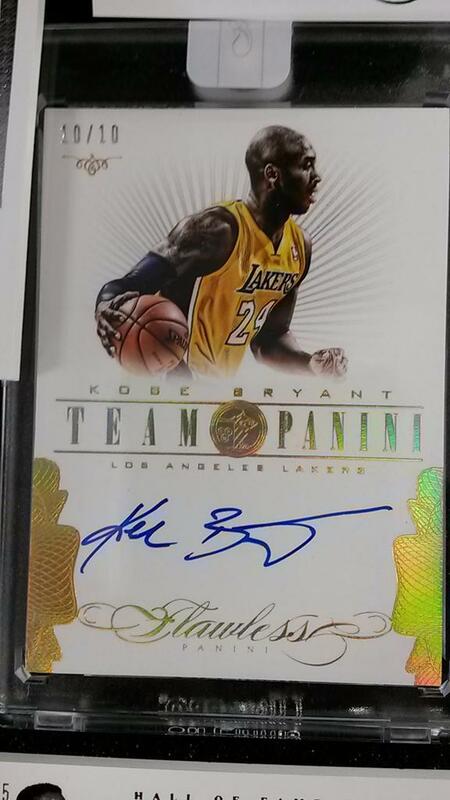 Here is Jonathan's Flawless Kobe Auto 10/10. Saul drove 200 miles from the Texas Valley to take advantage of our INVENTORY REDUCTION SALE. He decided 2014 Spectra Football ($159.95 per box) with 10 Autographs or Memorabilia per box was the way to go. Here is Saul with his Teddy Bridgewater Auto Jersey Patch RC and Blake Bortles Auto Jersey Patch RC. 2014-15 Select Basketball ($129.95 per box) continues to produce Huge Hits and customers keep coming back for more. Aggie Will tried a box and pulled two Tie Dyes and a 1/1 Black Prizm. Florida Will tried one box and pulled a Jabarri Parker Autographed Die Cut #d/10. This was the third one pulled at our store! Yes, he also pulled a Victor O Gold Prizm Auto #d/10 and a 1/1 Black Prizm Die Cut Shield. The Kyrie Auto Patch came from a box of 2014-15 Spectra Basketball ($310.95 per box). Aggie Will decided to do a "heat check." 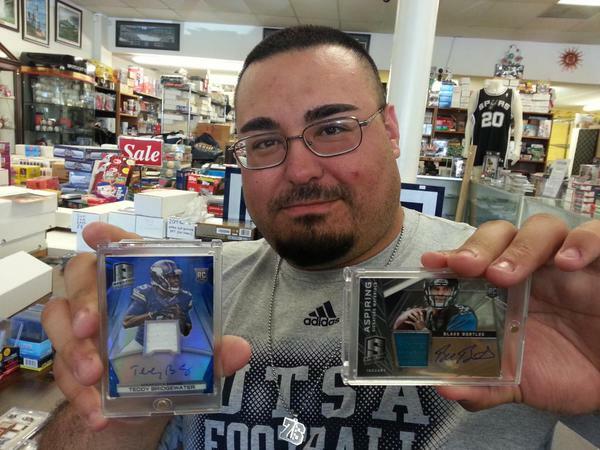 He tried a box of 2014 Topps Supreme and pulled a Teddy Bridgewater Auto Patch RC #d/10. 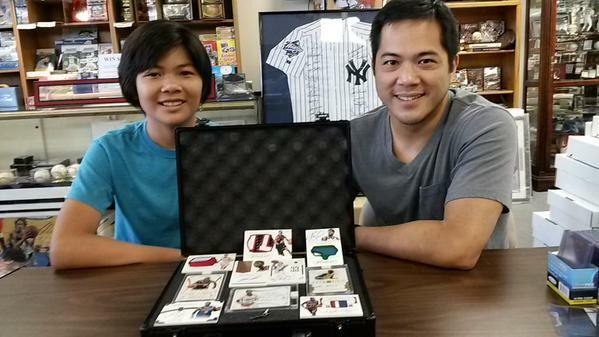 Next Will used his hotness to pick a box of 2014 Topps Five Star and pulled an Odell Beckham Auto Jersey Patch RC 5/35! So be like Aggie Will. 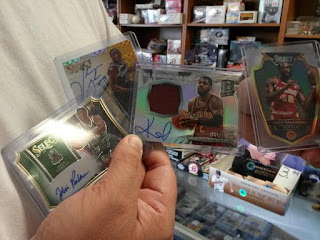 Go to Sports Cards Plus, a.k.a. The Super Hit Factory and pull your Super Hit. Ben came in for our INVENTORY REDUCTION SALE. He decided 2014-15 Immaculate Basketball for only $539.95 was the way to go. Last year Ben pulled a LOGOMAN Jersey Patch and this year he was hoping for another. 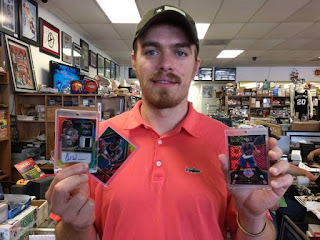 Here is Ben with his Anfernee Hardaway Auto Patch and James Young LOGOMAN Jersey Patch RC. Brian is on leave from is assignment in Korea. He heard about our INVENTORY REDUCTION SALE and decided to give 2015 Contenders Draft Football ($130 per box) a try. Here is Brian with his 2015 Contenders Jameis Winston Autographed Season Ticket RC. Florida Will loves the look of 2014 Panini Black Gold Football ($179.95 per box). He tried a couple of boxes. Hits included the Tom Brady auto #d/10, Andrew Luck Auto 10/10, Marquese Lee Autographed NFL LOGO Laundry Tag Patch 5/5, Peyton Manning Solid Gold Coin #d/20, Odell Beckham Auto Jersey Patch RC, and Odell Beckham Black Gold NFL Shield 1/1! 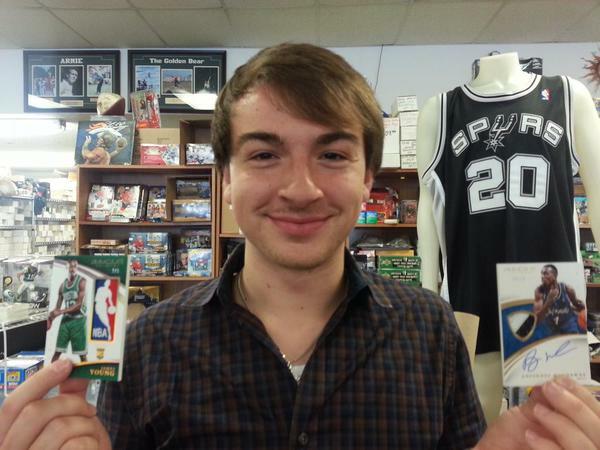 Tommy came in for our INVENTORY REDUCTION SALE and decided to give 2014-15 Spectra Basketball ($310.95 per box) a try. Here is Tommy with his latest Andrew Wiggins Autographed Jersey Patch RC #d/35. Mark and his wife came in looking for Super Hits and decided to give 2013-14 Upper Deck Black Basketball a shot. Mark pulled an Anthony Davis, Kyrie Irving, Michael Kidd-Gilchrist Triple Auto Booklet #d/15 (second pulled at our store) and his wife pulled this Julius Erving Auto #d/15. So, what are you waiting for? Our INVENTORY REDUCTION SALE won't last forever........ Go to Sports Cards Plus TODAY. Pick your box from The BEST CASES in The Hobby at The LOWEST Price in The Galaxy (all of Texas) and have have some fun!